How can you keep your MRI system running at the highest level of efficiency, for the lowest amount of money? BC Technical has over 20 years of experience providing monitoring, service, parts, and upgrades for MRI systems all over the world, with the capital backing to respond to any needs our customers have. When we say no job is too big, too small, too far: we mean it. 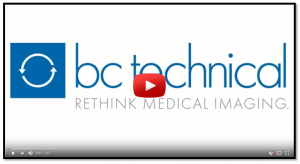 Take a look at what BC Technical can do for you. Think of ColdTrac like a smoke detector. You probably don’t think about them much except to change batteries once a year, but if a fire starts in your home they can literally mean the difference between life and death. MRI magnet failure may not be quite that extreme, but knowing how catastrophic magnet failure can be why would you leave the monitoring of your MRI magnet to chance? ColdTrac continuously monitors critical parameters in your system in order to detect potential problems before cryogen loss can occur. Unlike many monitoring services, ColdTRAC is a ‘push’ technology, which means instead of needing someone to pull the data from the machine and have eyes on it 24/7, ColdTrac instantly alerts up to 16 different contacts if a problem occurs, allowing for fast repairs at the lowest possible cost. With ColdTrac, the chance of catastrophic failure is almost none, and installation won’t even impact patient scanning. All you need is a VPN interface. Contact us today to find out how to get ColdTrac installed on your MRI system. If ColdTrac is the smoke detector, our service plans are the fire insurance. We’ve got a full range of flexible services and service plans available to fit the needs of your facility. From basic preventative maintenance or performance evaluations, to backing up your in-house engineers, to providing a full service package, we can accommodate you with the capability to service more different types of magnets and systems than any other ISO or OEM. That translates to a lot of convenience for you. Inevitably, when you need a part you need it now. BC Technical has a huge inventory of over 65,000 imaging parts located within easy distance of Chicago’s O’Hare and Midway airports. We can get anywhere in the United States within a few hours, anywhere in the world within 20 hours. That means less downtime and revenue loss for you. Pricing is economical, and quality is extremely high with our parts undergoing real-time testing on live systems so you know the part you’re getting will not only have better longevity, but it will work, every time. Moving a magnet? Purchasing a magnet but your location isn’t ready yet? No problem. BC Technical has a climate-controlled warehouse with 3, 10- ton chillers available for your convenience. The facility is fully secure, with guaranteed power at all times. Store your magnets with us until you’re ready for install – we can do the install too. With BC Technical, lowering your risk doesn’t have to mean astronomical costs to your bottom line. Fill out the form below to have a representative contact you about a solution that fits your needs, or call 1-888-228-3241 today. We look forward to hearing from you.